One of the many good things in writing about spirits is that you often get invited to launch parties and private tastings for products before their official release to the market. 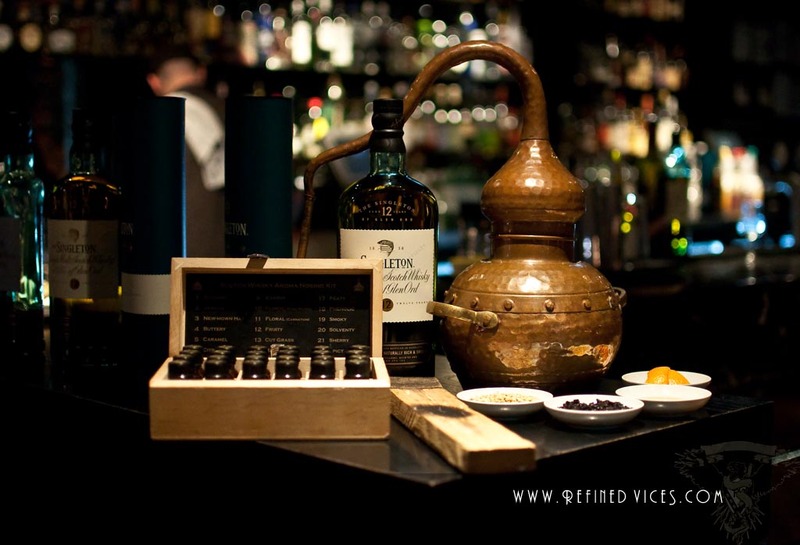 Refined Vices was happy to join the tasting of the Singleton of Glen Ord lineup in the Galley Room at Melbourne's Waterside Hotel. At the door I was welcomed in by Sean Baxter from Diageo, who guided me to the bar where I was introduced to a few other guests and Sven Almenning from Eau de Vie who would be taking us through the tasting of 12, 15 and 18 year old Singleton whiskies. Before the actual tasting, we were offered complimentary cocktails and an assortment of tasty appetisers. The Singleton whiskies are a collection of Single Malt whiskies from the Highlands intended at an affordable price point to new generation consumers who are just getting started with Single Malt whiskies, while remaining complex enough for the experienced taster. Curiously Singleton whisky is sold under the same name in Europe and the USA, but for each of these markets the whiskies come from a different distillery. For the USA the whiskies are produced in the Glendullan distillery, in Europe the whiskies come from Dufftown, while in Asia and Australia the whiskies available are produced at the Glen Ord distillery. Proceeding from one whisky to another, it was intriguing to see the how they evolved with age and to spot similarities between each expression while being different enough to keep it interesting. The Singleton of Glen Ord 12 year old is available at select retailers priced at around 65 to 75 $AUD. Check out the rest of the pics on Facebook! Many thanks to Laurene for the invite and Sven for the presentation and all the wonderful staff members at the Galley Room.